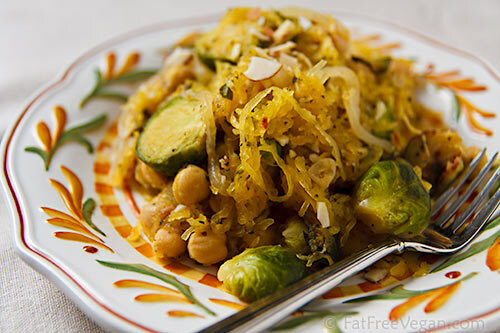 Spaghetti squash can be a dieter’s best friend if you remember three things: 1) It doesn’t taste like pasta, 2) It doesn’t interact with sauce like pasta, and 3) It doesn’t taste like pasta. Okay, I know that’s actually two points, but the first bears repeating. Spaghetti squash tastes like–surprise!–squash, and if you sit down to a plate of it expecting to bite into a forkful of angel hair, you’re going to be disappointed. 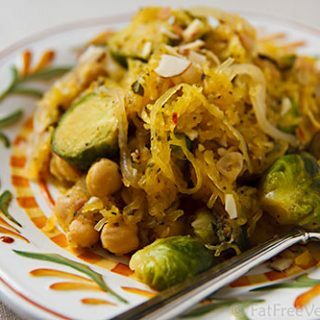 But if you’re expecting lightly sweet squashy flavor in fun-to-eat strands of gold, you’ll love spaghetti squash in general and this recipe in particular. 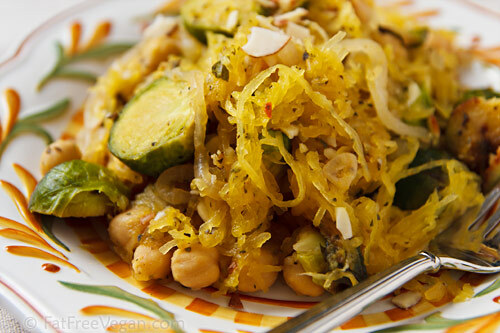 Besides tasting like squash, spaghetti squash has the texture of squash. Though its strands resemble thin noodles, it doesn’t have the starchiness of pasta so sauces don’t cling to it. That means that you don’t want to douse it with lots of sauce because the sauce tends to sink into a puddle underneath the “pasta.” Using just enough sauce to spread the herbs and seasonings through the golden strands is the key to working with spaghetti squash. The lack of starchiness does have one huge benefit, which is why I mentioned the D-word above: On almost any diet plan, from Eat to Live to Weight Watchers to South Beach, spaghetti squash is considered a non-starchy or “free” vegetable. Many of us start the year off trying to adhere to specific diets, and this recipe is a light and healthy option that should fit easily into any of them. 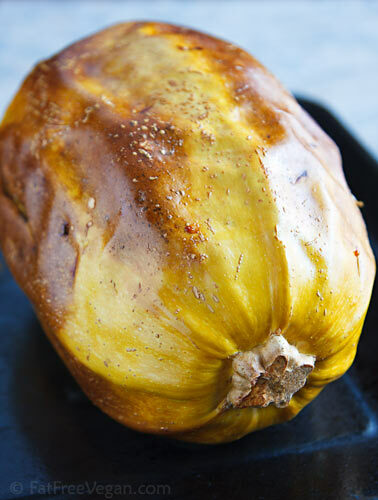 Spaghetti squash is much easier to cut if you roast it first. I like the flavor of roasted spaghetti squash much better than steamed, but I was using an older squash that was so hard to cut that I was in danger of losing a finger if I kept trying. So rather than cut it in half to bake, I pierced it several times with a metal skewer and put it in the oven whole. It was much easier to cut after roasting, and it still had that smoky-sweet roasted flavor. If I had thought about it, I would have put a head of garlic in with it to roast, but I didn’t so I added fresh garlic later. If you’d like, trim the top off of a head of garlic, wrap it in foil, and bake it along with the squash, checking after 45 minutes to see if it’s softened but not burned. Squeeze out as many of the cloves as you like into the pan when you add the Brussels sprouts and mash them with a fork. I have to also note that my daughter E, upon looking into the pan as I was finishing cooking, said, “Do I have to eat that?” Our rule is that yes, she has to eat at least a small serving of whatever I cook. (The poor kid is my involuntary recipe tester!) I was really surprised when she finished her small serving and her salad and went back for a little more of each. When questioned, she said that it was “actually pretty good.” Then she poured herself a bowl of Fruitful O’s and soymilk. Oh well, adolescents need their sugar and starch, I suppose. This makes about 5 large servings, but since it’s so light, count on people eating 1-2 servings if there’s not much else on the menu. The red pepper flakes make this dish slightly spicy, so reduce them if necessary. While the squash is cooking, prepare the Brussels sprouts. Trim and discard the ends and cut the sprouts in half (quarter larger sprouts). Place on a baking sheet and spray quickly (2 seconds) with olive oil. (This prevents burning; if you don’t want to use the oil, cover loosely with a sheet of aluminum foil.) When the squash has almost finished cooking, put the sprouts into the oven and bake for about 15 minutes, stirring halfway through. Remove them when they are just beginning to be touched by brown but are not burning (they will finish cooking in the skillet in the next step). In a large, deep, non-stick skillet, cook the onions on medium-high heat until they become golden, about 5-6 minutes. Add the Brussels sprouts, garlic, and vegetable broth and cover tightly. Cook for 3-5 minutes, adding more broth or water if skillet becomes dry. Add the chickpeas, basil, and red pepper flakes. Stir in the spaghetti squash, and toss gently to mix. Cook until heated through. Add salt and pepper to taste, along with lemon juice. Serve topped with crushed or sliced almonds, if desired. Made this tonight…highly recommend! This is wonderful! I made this for dinner tonight. I roasted my squash in advance, so it was a really quick dinner. I love the mix of textures, too, and it’s simplicity. I didn’t have stock, so I used white wine. Added some fresh chopped herbs and served with freshly grated Parmesan and lemon wedges. It was absolutely delicious! I am about ready to pull the squash and brussel sprouts out of the oven and realized your next step says to cook the onion in a non-stick skillet . No oil needed? I don’t use non-stick cookware and don’t know if that is one of the benefits to using a non-stick pan . So I will spritz my pan with some olive oil and cook away. Can’t wait to try this! This was terrific! I had a very large but fresh spaghetti squash, so I did slice it in half before roasting — although I had a bit of an Excalibur moment doing so. The squash was so large that I only used half of it. As I added it to the brussels sprouts mixture, the squash was looking like it would overwhelm the whole dish. One normal sized spaghetti squash would have been fine. I also had a lot of fresh basil, so used between 1/4 and 1/2 cup of that. It worked really well. The almonds were a nice touch. The dish was delicious, and I am thrilled that it is Eat to Live friendly. It made a TON. I’m looking forward to finishing it off for lunches this week. If you like things pretty spicy (as we do), a bit of sriracha at serving time tastes fantastic. This is now my favorite spaghetti squash recipe. Made this tonight without basil b/c oops! I was out! Still so delicious!! If I hadn’t cooked it myself I’d have sworn it had butter/butter sub in it b/c of the flavor. This recipe is so yummy, made it today and we really enjoyed it and are looking forward to leftovers tomorrow. What a great veggie combination. This came out bland and dissatisfying. For some reason the squash needed to cook for a half hour longer, even though I poked about 20 holes deep into the squash. Also, I used garlic powder instead of cloves and I think that probably killed the dish. Either way, not making it again. Hi I am just looking at your recepie, it looks great just one thing, what is a spaghetti squash, does it go by a different name in some countries like other veg I don’t seem to have come across it, thanks Steven. Just made this, and it turned out well. Did not add the almonds but am contemplating some toasted pine nuts, that I have on hand. Thanks for another great recipe. Eating this now and it’s not love 🙁 I didn’t have any lemon juice, is that a make or break ingredient? I feel like its just bland. I am not the best cook so I am not sure what to add to make it better. I really wanted to love it. Lemon juice gives it the kick needed in low-salt recipes. I wouldn’t omit it! First time I’ve had spaghetti squash, first time I prepared it–and the results were delicious! I made all kinds of substitutes though (vegetable substitutes mostly)–for the brussels, I used cauliflower and spinach (and they were frozen and not roasted); for the chickpeas, leftover lentils; and for the lemon juice, lime. With all that, it turned out to be a very nice dish for my tastes. And the squash is so very yummy! I had to stop myself from eating it just out of the oven. Once, I saw a very renown cooking and household guru and business mogul prepare it on one of her shows, and all I can remember is the amount of olive oil she doused it in. LOADS of it. I recall thinking, “She could fry a whole catfish in all that oil!” Given that, I thought it would be bland. But far from it, it has a nice flavor with sweet tones. So many possibilities for its use. Thanks for this introductory recipe, Susan. I’ll be happily trying out others. I made this for supper today and I guess I was expecting more flavor. I’d be interested in any suggestions for making this dish a little bit more flavorful. I doubled the lemon and basil for more of a kick. What happened to your Pin button? It went missing, but I think it’s back now. Try refreshing the page. Just had this for lunch, this was AWESOME. My two toddlers both liked it. I’m surprised to see the other comments about it being bland; I used plenty of pepper flakes and lemon juice, and it turned out very flavorful! I also used fresh basil instead of dried. Hi – This looks great. I’m slightly allergic to chick peas. Do you have a recommendation for a substitution or should I just leave them out? I think another white bean or cubes of baked tofu would be good, but you could leave them out if you prefer. I made this following the recipe but was unsuccessful. We really enjoy spaghetti squash and roasted brussel sprouts so I thought this would be a real winner. However, we found it to be very bland. The onion flavor was lost, the sprouts needed some flavor to have been added when roasting, and the lemon and basil disappeared. I would only make this combination again by at least doubling the onion and all spices plus seasoning my sprouts when roasting. This was a real disappointment except for the calories. I’ve been searching for an old recipe that I seem to have lost and was hoping it struck a cord with you. I thought it was from Vegetarian Times but it isn’t in their on line archives. It was a very simple spaghetti squash, navy beans, and corn saute with manchengo cheese. It was called Three Sisters of … something. Anyway, in the meantime I’ve stumbled across another of your delicious creations. I have garbanzos in the pressure cooker now so I can try this for supper tonight. Can’t wait! Thanks, as always, for your hard work to share good food!